This tutorial will show you how to compare two numbers and calculate their ratio, such as 5:7 or 8:3. The GCD Function is used to calculate the greatest common denominator between two or more values. We can use GCD to then create our ratios. •	Click on “Excel Add-ins. •	A small pop tab should appear. Be sure that Analysis ToolPak is selected. •	The ToolPak should now be available in the Data tab with the title “Data Analysis.” If you do not see it, you may need to reload your page and check again. •	A new window titled “Add-Ins” should appear. Select Analysis ToolPak. The GCD Function is extremely easy to use. Simply type =GCD( followed by the numbers that you wish to find the greatest common divisor of (separated by commas). For example, our first row would be calculated as: =GCD(B3,C3) with the answer being 5. Once you understand how GCD works you can use the function to find your ratios by dividing each of the two numbers by their GCD and separating the answers with a colon “:”.Keep in mind that the answer will be a text value. Another method to calculate ratios is the Text & Substitution Method. This method does not require the Analysis ToolPak to be installed. The Text Function allows you to display an answer as a text value. In our case it will divide Number 1 by Number 2, but instead of producing a decimal value the answer will be displayed as a fraction, such as 5/4 or 9/2. 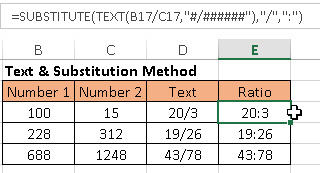 The Text Function tells Excel to display the answer in the form “num1/num2” The extra ##### in the Text formula tells Excel to display the largest fraction. If you only specify #/# you may receive a rounded answer because Excel will display a fraction with only one digit for the numerator and denominator. To display the fraction in the desired ratio format you will have to substitute the slash with a colon. This will involve using the Substitution Function.